This is almost unheard of (for me)...3 days of blogging in a row! Taking the week off to grieve really put me behind. You wouldn't guess it, but I'm actually on vacation right now. My family is watching the animals while my husband and I visit Savannah, GA. I was just on the beach in Tybee Island a few hours ago and figured I should get my post up. I've been excited to show tonight's polishes since Natalie from Noodles Nail Polish mentioned she had some neons she was testing. She released a brighter trio at Polish Con and all leftovers were very quickly snatched up. The trio + crelly releasing this Saturday, July 28th at noon ET will retail for $9.50 each (only sold individually) and will restock at the same time on Aug. 1st should they sell out. Oh, and all of them are black light reactive, but more on that later. Follow me after the break for lots more photos. Up first is Girls Just Wanna Have Sun which is a neon yellow crelly base with silver and lavender holo glitters and purple flakes. I should mention that the same glitter and flakes are in every polish in the trio. Yellows are notoriously hard to work with, but I didn't really have much of a problem here. It was the sheerest and thinnest of the 3 neons, but that's to be expected. I had no issues with the formula or application at all, nor did I need undies to cover any VNL. They all dried with a satin finish from the neon pigment, so make sure to use a topcoat for a glossy finish and to smooth out the glitters. Up next is One in a Melon which is a watermelon pink crelly with the same silver and lavender holo glitters and purple flakes. This one was the most pigmented of the 3, and had a nice, thicker texture (in a good way). If you're a bit shy with bright colors, this one may work better for you because bright pink is more of a "normal" color. And last, but certainly not least we have Tropic Like It's Hot which is a neon orange crelly with silver and lavender holo glitters and purple flakes. I used 2 thicker coats with this one and there is the teeniest bit of VNL in my photos. You can't see my nail line in real life, so I think everyone would choose to go with 2 coats. You know I love orange polishes, so this one holds the #1 spot for me. Don't forget that topcoat because this one, like the rest, dries with a satin finish and a bit of texture. Natalie is also releasing another white crelly this month! 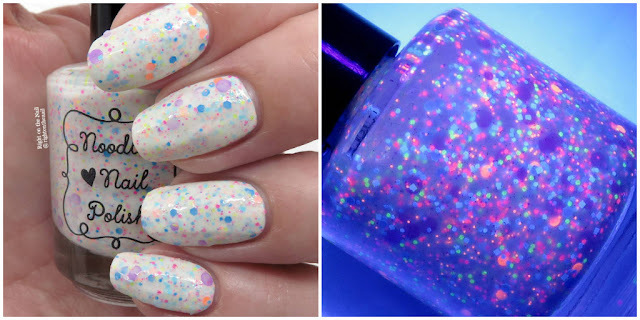 Don't Worry, Beach Happy is a white crelly base with neon hexagonal glitter (orange, pink, aqua blue, and yellow) and larger circular purple glitter. 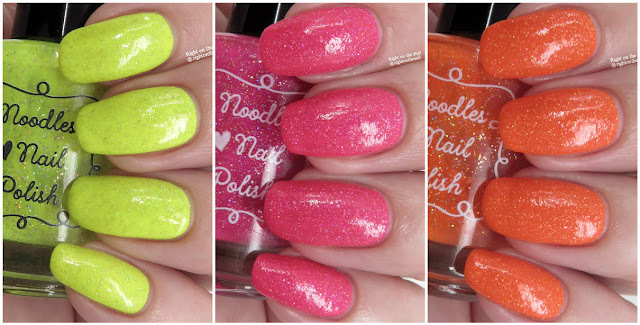 It is similar to the Noodles Nail Polish Beach Please, but I think Don't Worry, Beach Happy has a wider variety of glitter sizes compared to Beach Please. Unfortunately I don't have both to do a comparison, but they definitely look different based on photos. I am so happy Natalie went and did some neons for the summer. You can see in the photos above that they all react to black light, especially Girls Just Wanna Have Sun. Oh, and the names are just precious to top it all off. I received multiple compliments from strangers while wearing them, and I think they would make fabulous pedicure polishes as well. Again, these will retail for $9.50 each, and will be available this coming Sat. (July 28th) at noon ET. You can find out more about Noodles Nail Polish on their website, Instagram page, Facebook page, and Facebook Fan Group.